Owen, Laura Hazard. "Vox.com tries a membership program, with a twist: It’s focused on video and entirely on YouTube." Nieman Journalism Lab. Nieman Foundation for Journalism at Harvard, 6 Feb. 2019. Web. 20 Apr. 2019. Owen, Laura Hazard. "Vox.com tries a membership program, with a twist: It’s focused on video and entirely on YouTube." Nieman Journalism Lab. Last modified February 6, 2019. 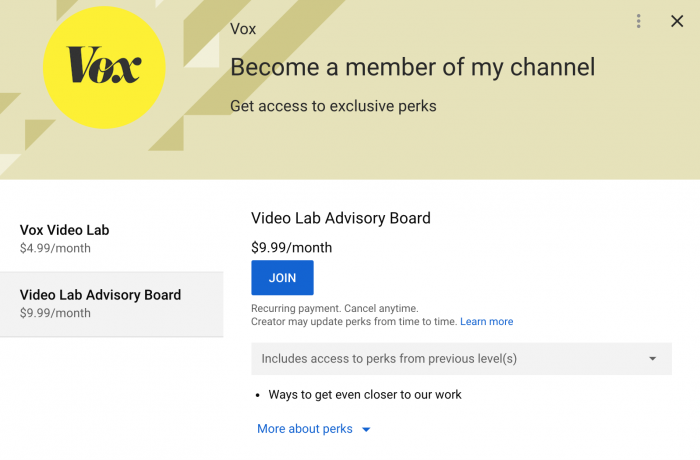 Accessed April 20, 2019. https://www.niemanlab.org/2019/02/vox-com-tries-a-membership-program-with-a-twist-its-focused-on-video-and-entirely-on-youtube/.